Several times a year four of the most distinguished living actresses in England (or anywhere else) like to get together at the country home owned by one of them and hang out. The film director Roger Michell (“Notting Hill”) had the excellent sense to accompany them at one such session with camera and crew. 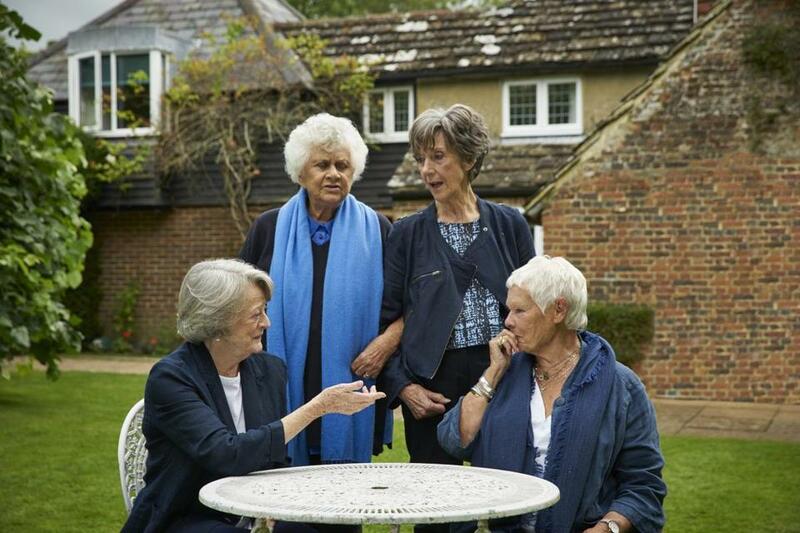 Maggie Smith, Judi Dench, Eileen Atkins, and Joan Plowright (the homeowner) offered no objection. They’re performers, after all, and what an opportunity for performance this is. Each of these dames of the realm gets to play the choicest of roles: herself. Now 84, Atkins is likely the least known to US audiences. She was Queen Mary on “The Crown,” and to see the sibling rivalry between her and Helen Mirren in “Gosford Park” (2001) is to know just how cold ice can be. Michell intersperses the gabfests with film clips and period photos. From one of the latter, we learn just what a stone fox the young Atkins was. What may be the most remarkable moment in this remarkably delightful movie has nothing to do with acting and getting off zingers. Smith recalls long-ago visits to the Plowright/Olivier house, when her children were young, as were theirs. “I suppose,” she says, “that’s what it was all about in those days, the children: very small people running around.” The look on her face encompasses sadness, fondness, memory. She’s as far away as the past — and as close. It’s a glimpse of a very great actress reduced (or enlarged) to being just like those watching her: a human being. That’s the most challenging role of all. Directed by Roger Michell. Starring Maggie Smith, Judi Dench, Joan Plowright, Eileen Atkins. At Kendall Square, West Newton. 83 minutes. Unrated (as PG-13: the occasionally hilariously deployed F-bomb).